The beauty of the game of pickleball is that whether you are a seasoned pro or just getting started, you can have fun playing the game. After all, pickleball is a social game – meaning that it is designed to get people interacting with one another as they play. So if you are going to be talking while you play, shouldn’t your clothing make a statement too? As one of the fastest growing sports in the country, the game of pickleball is getting more and more attention. That means that equipment manufacturers are starting to create more specialized paddles and other equipment for players. And apparel companies are following suit to create more pickleball shirts for women and men. Even though the popularity of the sport of pickleball is growing dramatically, many people still have never heard of it. 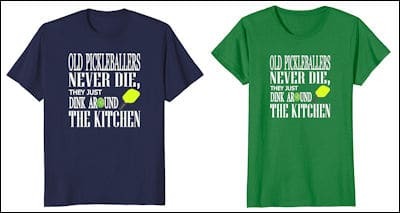 But given the unique name of the sport, along with game lingo like “dink” and “kitchen”, there are countless ways to create pickleball shirts that are both cool and funny. By wearing pickleball apparel when you play the game you can set the tone of the match. If you show up sporting a t-shirt that takes an aggressive stance on your love for the game you tell your opponent not to take you lightly. Conversely, wearing a more lighthearted shirt will send the subconscious message that you are there to have fun. Either way, you are sending the signal that you love the game and all that it entails. Great pickleball shirts are not just for use on the court, though. Ever since the 1970’s people have been expressing themselves with printed shirts, using pithy sayings to communicate with the people that they meet. By expressing your love for the game of pickleball on your shirt you can open up the sport to countless people as you navigate your daily routine. 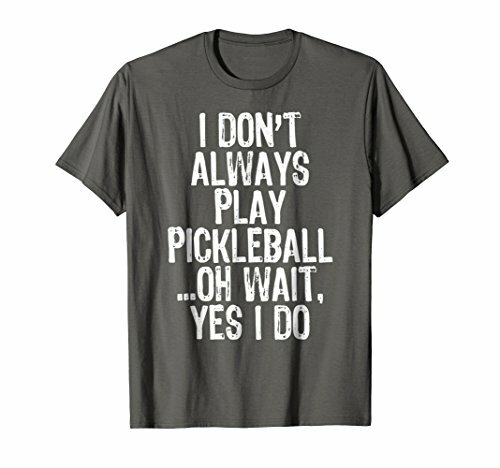 A provocative or funny pickleball t-shirt is a great way to start a conversation that introduces more people to this wonderful game. Laughter is the best medicine, and nothing makes you feel better than a humorous pickleball t-shirt. 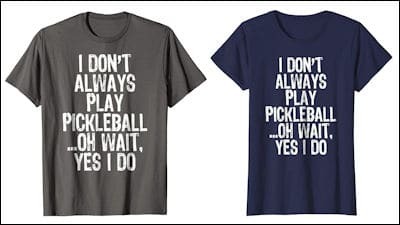 Humor is subjective, but we feel these shirts will put a smile on any pickleball lover’s face. And all our top picks have the added benefit of coming in styles for both women and men. Even teetotalers can appreciate a good drinking pun, so this shirt will put a smile on their face whether or not they imbibe in adult beverages. The women's cut also offers 5 different color choices, but with a smaller size run from small to XL. I Dink, therefore I am! 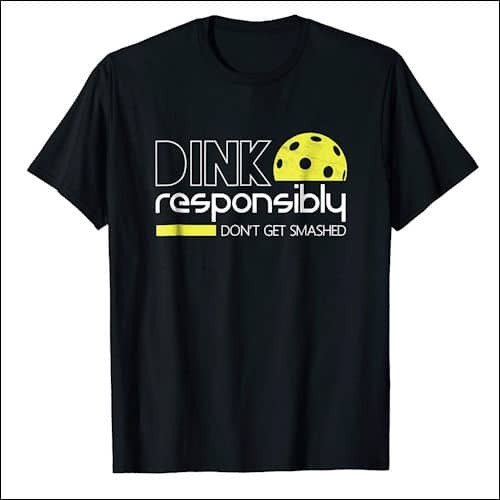 Learn how to Dink Responsibly with this funny pickleball t-shirt! 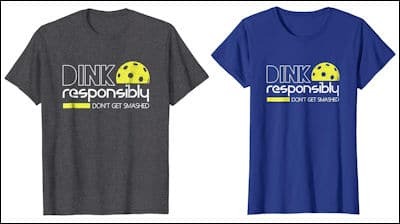 If it's always pickleball season for you, pick up this Dink Responsibly Pickleball t-shirt before you play next! This funny pickleball t-shirt that reads Don't Get Smashed makes a great gift for any pickleball player or pickleball fan! True pickleball aficionados understand how the game can grow on you, sometimes to the point of fixation. That is why this t-shirt that pays homage to seemingly non-stop play will bring a chuckle. The men's version of this tee is available in 3 different color variations and sizes small through 3XL. The version for the ladies comes in the same 3 colors and sizing from small through XL. 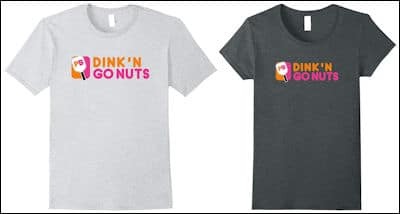 One glance at this Dink’n Go Nuts pickleball shirt and you will recognize the play on a famous doughnut maker’s logo. The colors and style make it the perfect pickleball parody. The male version of this shirt runs in sizes from small to 3XL, and come in four different color choices. 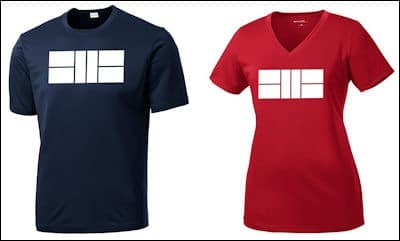 The female shirt has a shorter size scale – small through XL – but comes in the same four colors as the men’s version. Perfect Pickle ball t-shirt for fans of pickleball. Great for Young, Mature, Elderly, Old, retired folks. Grab your pickleball paddle and learn how to play pickleball. People who are retired or in Retirement homes love this sport! Pickleball is a fun sport that combines many elements of tennis, badminton and ping-pong. It involves a Paddle and a plastic ball. It is played both indoors or outdoors. How to play pickleball is easy, you need a pickleball paddle, ball, and this shirt. Our #4 choice is another play off a recognizable brand, with a bit of a twist. 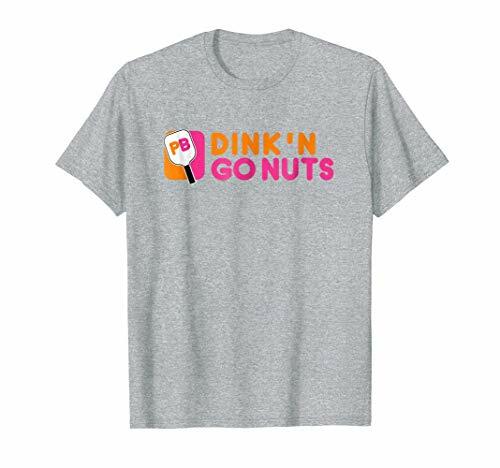 Unlike the previous shirt the Just Dink It t-shirt targets a famous brand’s slogan rather than a logo. And the result is pickleball perfection. 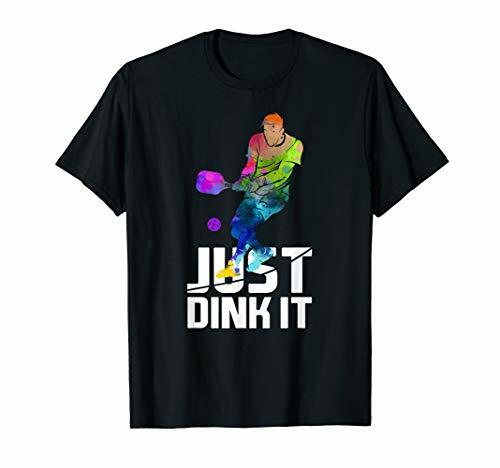 The men's Just Dink It t-shirt features a watercolor design that comes in 2 different shirt color choices, and sizing that ranges from small to 3XL. 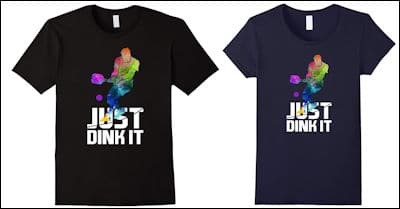 The women's Just Dink It shirt comes in the same design and shirt color choices as the men’s t-shirt, and sizes from small up to XL. Our #5 pick for top funny pickleball shirts is another allusion to alcoholic consumption, paired with a play on words. And both the graphic and the slogan are guaranteed to garner grins on your next trip to the pickleball court. The men's cut of this shirt comes in 5 distinctive colors, with sizes ranging from small thru 3XL. The women's cut of the shirt comes in the same five color choices as the men’s, but with the familiar smaller size range of small thru XL. Pickleball I Dink in the Kitchen Warning T shirt. 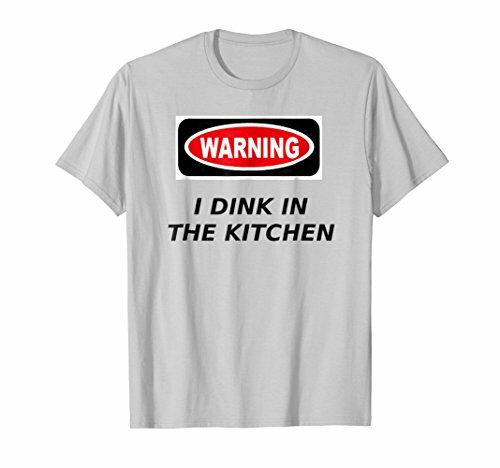 Your team will love wearing this funny t-shirt stating: Warning I Dink in the Kitchen. Order your shirt today. Your family and friends will enjoy wearing this t shirt when playing the fastest growing game. The game of pickleball is not just for the young, as is evidenced by the growing number of middle-aged and seniors that enjoy the sport. For those who love the game, and intend to continue playing as long as their body will permit it, this t-shirt is the perfect way to send that message. It includes the caption “Old pickleballers never die… they just dink around the kitchen“. The men’s version runs from sizes small to 3XL, while the women’s shirt comes in sizes small to XL. Dri Fit shirts are made from a high performance fabric that is designed to keep you dry and comfortable while you play. It does this by moving sweat away from your body and out to the surface of the fabric where it can evaporate. There are a number of Dri Fit shirts available, but not that many made specifically for pickleball. But we did find a good one with versions for both sexes. One great example for a Dri Fit shirt for guys is the Men's Dri Fit Pickleball Court Shirt from Dinkers & Bangers. This attractive polyester shirt has a pickleball court design that is both subtle and attractive. 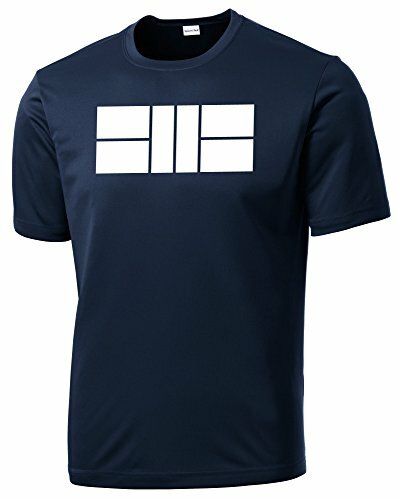 The Men’s Dri Fit Pickleball Court Shirt comes in both navy blue and red, and ranges in size from small to 2XL. The Women's Dri Fit Pickleball Court Shirt features a v-neck, and comes in red and purple colors. The sizes on this women’s pickleball shirt run from small through 2XL as well. Guys who take up pickleball tend to go all in, which means they want the best equipment for the game. The shirts men wear on the pickleball court is seen as part of that equipment, so most want a shirt that properly conveys their approach to the game. 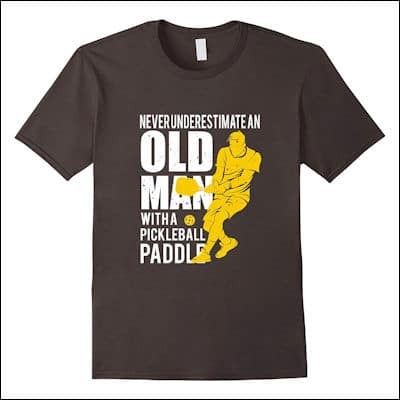 Below are some of the top men’s pickleball shirts available. Our first choice for best men’s pickleball shirt is one that playfully targets old men, although the style will really work for men of all ages. It features the saying “Never Underestimate An Old Man With A Pickleball Paddle”, and sends the humorous message that looks can be deceiving when it comes to court prowess. The attractive design comes in 5 different color choices, and sizes that run from small to 3XL, which means there will be a combination that works for every guy. Our 2nd choice for best pickleball shirt for men is spin on a classic sports design. 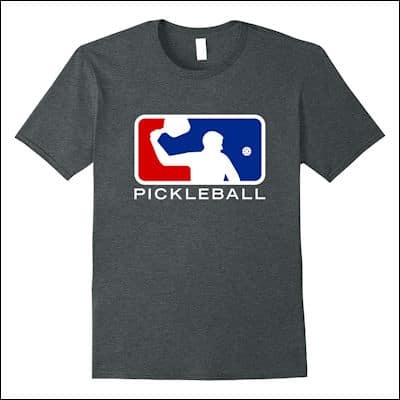 This t-shirt features a player and the word “pickleball” done using the distinctive colors and design of the Major League Baseball logo. 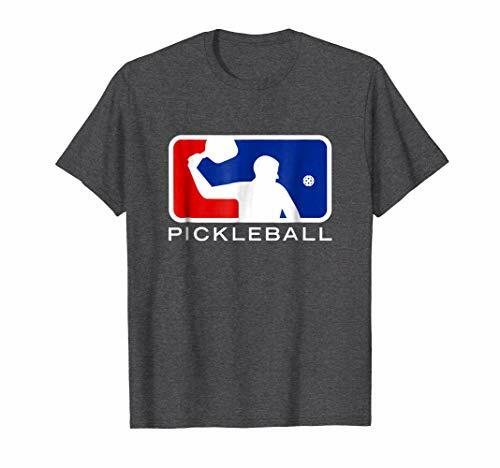 Baseball may be America’s favorite pastime, but this shirt aims to change that for any pickleball lover. With 5 different colors and sizing from small to 3XL this striking pickleball t-shirt is a great pick. Our third choice for best pickleball shirt for men is targeted squarely at the patriarchy. 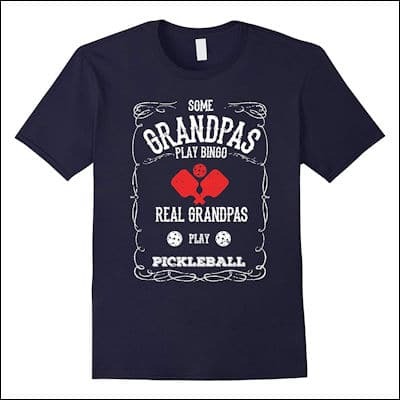 Cashing in on the stereotype of old men frittering away their time marking bingo cards, this shirt sends the message that “Real Grandpas Play Pickleball“. With five color choices and sizing from small to 3XL, there is definitely a version of this shirt to please the dinking Grandpa in your life. 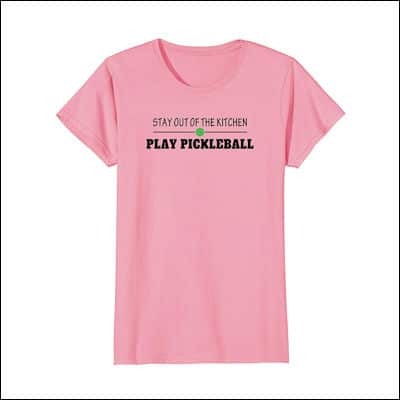 Ladies pickleball shirts are all the rage, which means that women have a variety of options to choose from when it comes to picking game apparel. Below are our favorite pickleball shirts for women of all ages, shapes, and sizes. Our favorite pickleball shirt for women takes a tired taunt and turns it on its head. 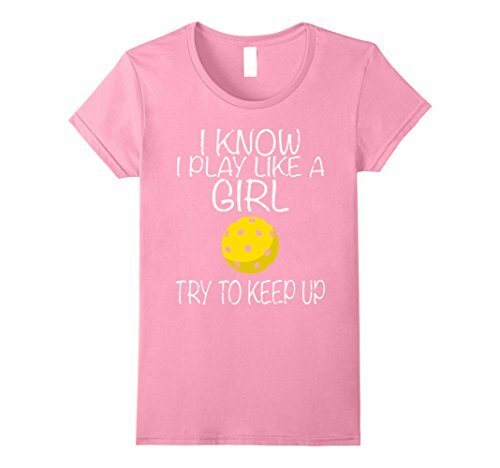 This cute tee says “I know I play like a girl… try to keep up“. It is the perfect retort to let others know that you take pickleball seriously, and aren’t intimidated by any man facing you across the net. This attractive t-shirt comes in five different color choices, and fits women sized small thru XL. Daughters awesome Pickle ball coach t-shirt for your college retired friend who always has their paddle, balls, & jersey! Cute aunts & proud grandmas watch son boys squad on the field at high school match. Funny Live life on the court for the game! Our second choice for favorite ladies’ pickleball t-shirt takes a modern spin on a classic phrase from history. 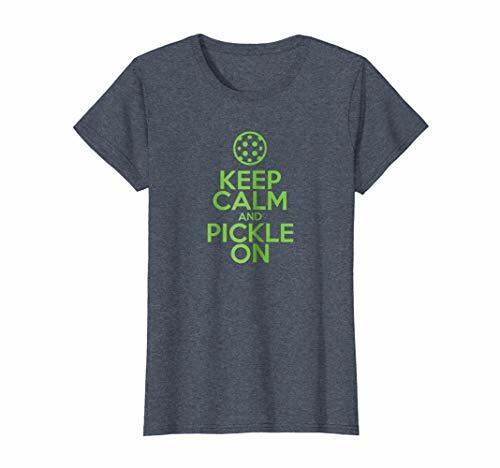 This shirt features the phrase “Keep Calm And Pickle On“, the pickleball version of the famous British motto from WWII. 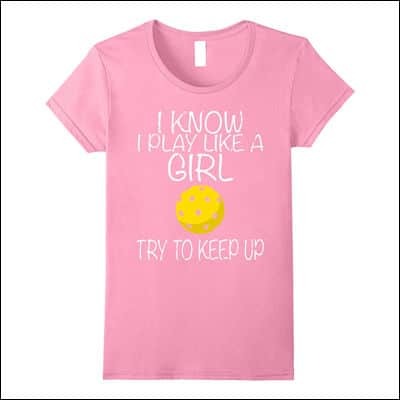 With five available colors to choose from, and sizes from women’s small to XL, any woman can demonstrate her poise on the pickleball court with with this stylish shirt. 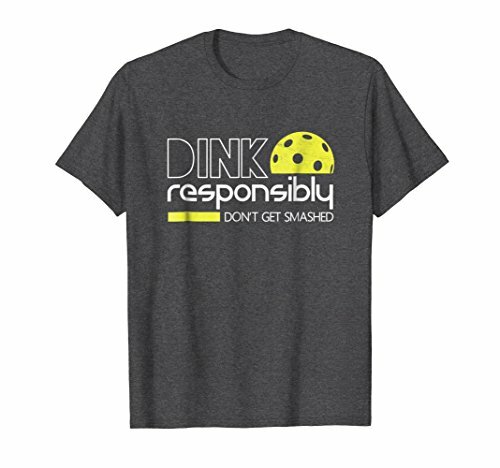 Perfect shirt for the pickleball player in your life that enjoys the dink as much as the slam. Drop that 3rd shot while wearing this great tee shirt. Who has serve? Great Retirement shirt. Pickleball is a fun sport that combines many elements of tennis, badminton & ping-pong. Play indoors or outdoors on a badminton sized court & a modified tennis net. Played with a paddle and a plastic ball with holes. Play doubles or singles. 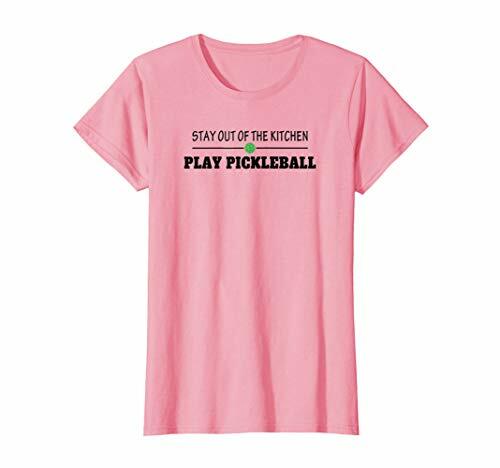 Our third choice for best women’s pickleball t-shirt takes a twist on an old stereotype, and mixes it in with a little pickleball parlance to come up with a pithy saying. 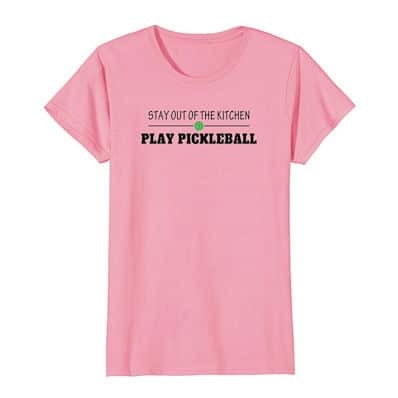 This shirt says “Stay Out of the Kitchen – Play Pickleball“, and does it in a fashionable and attractive design. 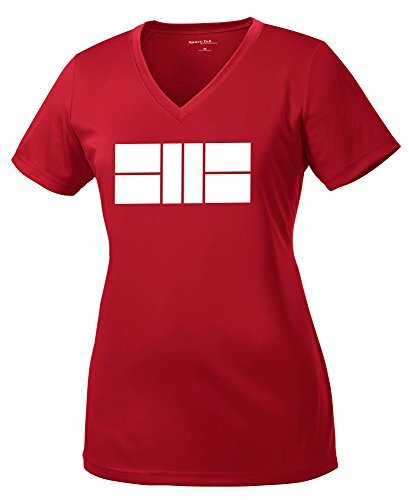 The comfy cotton shirt comes in five different colors, and fits ladies sized small to XL. Love pickleball? This tee is for you! This funny shirt says, "Stay out of the kitchen. Play pickleball!" Wear it to add fun to your next match or just hanging out with your fellow picklers! Perfect gift for men, women and kids who love pickleball! Get this cool and funny t-shirt to play in your local games or the next tournament!